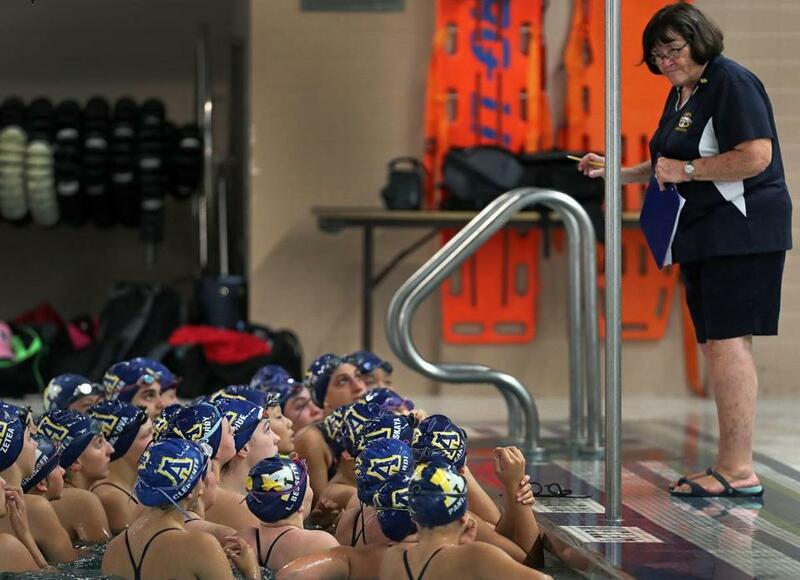 Twenty-seven year head coach Marilyn Fitzgerald announced her retirement from the Andover girls’ swim and dive program at the team’s end of season banquet on Monday night. Just more than two weeks earlier, Fitzgerald and Andover captured their fifth straight state championship, winning the Division 1 meet by nearly 300 points. The win marked Andover’s 18th state title during Fitzgerald’s tenure. Fitzgerald will exit the program with a senior class that finished undefeated, which is the second class to do so under Fitzgerald. Fitzgerald, 76, said she’s still of good health. But after 48 years of coaching, “it was just the right time,” she said. 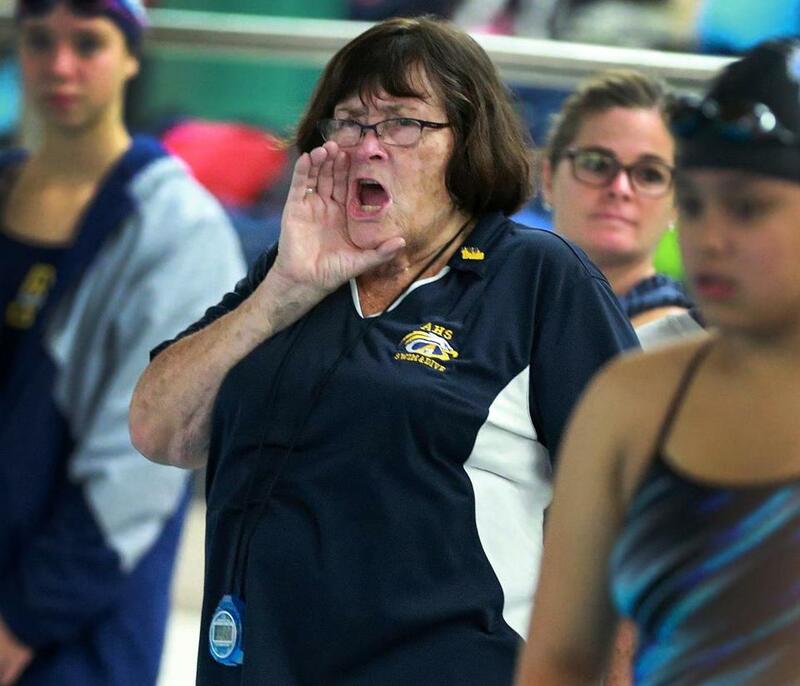 For the better part of a quarter century, Marilyn Fitzgerald, 76, has been a source of motivation for the Andover High girls’ swim team. Fitzgerald noted in her speech that she hoped daily motivational quotes to her swimmers would push them beyond the sport. She wanted the hardships of the sport to serve as lessons to the more than 400 swimmers she coached. Many athletes have gone on to be business owners, doctors, entrepreneurs and nurses, among other careers, Fitzgerald said. Fitzgerald retires as Andover’s fourth coach in program history which began in 1974. She leaves her program with her two assistants, Becky Pierce and Patty Barrett. 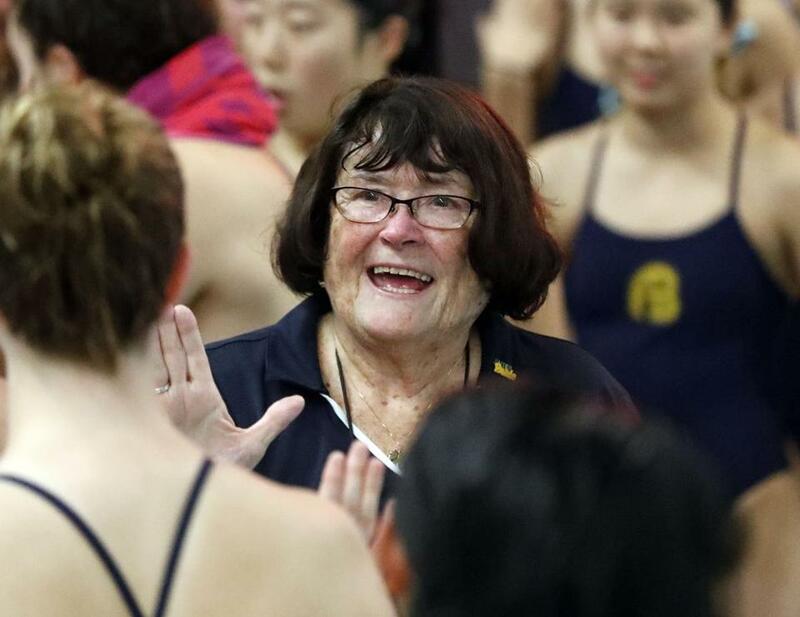 Andover coach Marilyn Fitzgerald, high-fiving one of her swimmers during a meet, said after 48 years of coaching “it was just the right time” to retire.